‘Tis again that season where everyone is running around being stressed but acting cheery, playing cheerful music and even literally referencing the word “cheer” on a regular basis. Bleh. 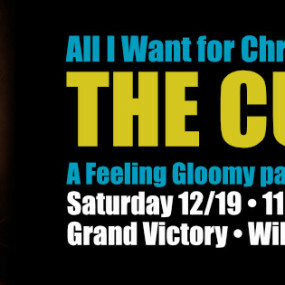 Once again, we here at Feeling Gloomy NYC are here to provide you with that bitter antidote, a holiday party where we will definitely not be cheerful, or buy us anything. We will be gloomy as all get out and glad of it. Once again we’ll be celebrating our own personal patron saint of Christmas, Robert Smith. Why? Because Disintegration is one of the greatest albums of all time, and uh, well he references December in it and uh, I don’t know. Do we need a reason to celebrate the Cure? I don’t think so. So we’re doing it. + Lots of info to come!